while the temperatures are too extreme for activity. Because they are ectothermic animals, snakes are vulnerable to excessive temperatures, both hot and cold. When the temperature reaches levels outside the snakes' comfort zone, its response is to seek shelter. In the fall, when temperatures start to drop, most people refer to this behavior as hibernation. In August of 2006, members of The Ohio Division of Parks and Team Snake constructed two artificial hibernation structures for the Lake Erie Water Snake at the Middle Bass Island State Park. These structures provide hibernation habitat for LEWS and other snake species residing within the park and marina. The hibernacula are just a portion of the beneficial aspects for LEWS the ODNR has included within their plans for development. So just how does one build a snake “hibernacula”? The MBISP hibernacula were modeled after similar structures built in southern New Jersey by other snake researchers, but with a few modifications. Construction begins by digging a hole approximately 6’ deep and 10’ x 10’ in size. Large rocks are placed at the bottom of the hole to create crevices that the snakes can utilize. Several pieces of flexible drain pipe fitted with “T” shaped pieces at the terminal ends are placed among the rocks within the structure providing entrance. The pipes also had 2” holes cut into the sides along the entire length of the pipe to provide snakes multi-level access. 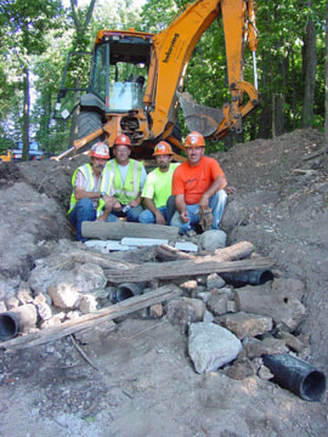 More large rocks, small logs and left over pieces of drain pipe are carefully placed and piled creating a multi-layered shelter. In the case of the MBISP hibernacula, recycled pieces of concrete were also used from an old septic tank the park had planned to remove. Smaller rock rubble is then piled on top and a piece of filter fabric is laid over the structure. The fabric is covered with approximately 2-3’ of sand and dirt while leaving the ends of the flexible pipes uncovered. As a final step, the entrances are surrounded with more pieces of small rock to reduce erosion. ​​In late October, after the snakes have moved to where they plan on spending their winter, the hibernacula will be surrounded with a “snake barrier” made of silt fencing and small snake traps. As snakes began to emerge from hibernation in the spring of 2007, the structures were monitored to determine whether any snakes successfully spent the winter within the hibernacula. Special thanks to those who helped in the planning and construction of these unique structures!